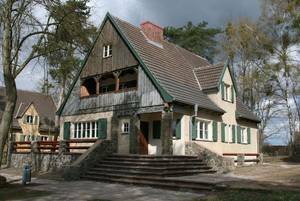 The SS called the four mansions for SS officers and their families “Führerhäuser”, the “officers’ houses”. They were built in 1939 as a part of the Ravensbrück Concentration Camp complex in close vicinity to the prisoners’ camp. The exhibition “The ‘Führerhaus’: Everyday Life and Crimes of Ravensbrück SS Officers” was opened in the camp commandant’s former house in March 2010. The new permanent exhibition provides information about the top male officers at the Ravensbrück Women’s Concentration Camp, a part of the history of the camp which has up until now not been dealt with in any detail. It complements the exhibition that was opened in 2004 in one of the female wardens’ houses about the female guards. The SS officers determined what the everyday conditions of imprisonment were like for more than 140,000 women, men and children who were incarcerated in the Ravensbrück Concentration Camp between 1939 and 1945. They are responsible for the deaths of tens of thousands of prisoners who died due to the conditions in the camp or by direct acts of murder. The exhibition depicts the perpetrators’ actions and motives as well as their everyday life and surroundings. Alongside traces of the Soviet usage after the war, there are also many traces from the time before 1945 in the original building. The building itself pays witness to the fact that the perpetrator’s everyday life was conducted in the middle of the concentration camp. Based on this main exhibit piece, the exhibition looks at the biographies and crimes of the Ravensbrück SS officers. Photos and documents from more than 25 archives in and outside of Germany, as well as some objects, are exhibited here in order to demonstrate the various aspects of the historical situation. While conducting research, it was possible to establish contact with some of the perpetrators’ relatives, including the daughter of the second camp commandant, Fritz Suhren. Her reflections, the SS officers’ justifications to the Allies’ tribunals, as well as reports from former prisoners can be listened to at four media stations. They provide information about the perpetrators and their actions from a variety of perspectives. Photo: Brandenburg Memorials Foundation/Ravensbrück Archive.